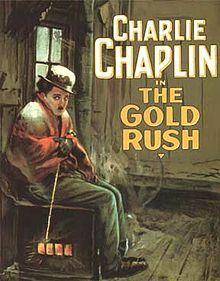 Charlie Chaplin later declared that he wished to be remembered for The Gold Rush and, today, the film is often considered one of the greatest of all time. The Gold Rush follows the story of the tramp who travels to the Yukon for the Klondike Gold Rush but he wanders into a difficult situation with a terrible storm with an amusing character named Big Jim and a criminal named Black Larsen. They fight over the gold mountain found by Big Jim. The Tramp wanders down to a mountain town and falls in love with a girl, played by Georgia Hale, who is only toying with him. He invites her to New Years dinner but she does not attend and he dreams himself flattering her and her friends by dancing with potatoes in a now famous scene. Big Jim comes to try to convince the tramp to go back to the cabin since he can’t remember its location and he needs this information to find the gold. After the cabin falls off a cliff they find the gold, narrowly escape, and discover the gold mountain. Eventually, he and Georgia fall in love as he becomes a multimillionaire headed back to civilization. It was filmed at his Hollywood studio where there were large and ornate sets established. Initially, Chaplin tried to film on location in Truckee, California, but he eventually abandoned this footage and returned to his studio. During the production of the film, Chaplin’s marriage to Lita Grey collapsed and he started a romance with Georgia Hale. The story was inspired by the Klondike gold rush, and the tales of the Donner Party. It was a massive success both domestically and abroad. In contrast to the slapstick comedy of Buster Keaton, Chaplin’s blend of humor is somewhat more subdued and melancholy. The Tramp is a character that an audience both pities and finds humorous, as Chaplin believed that tragedy and comedy are, at root, the same. Like Don Quixote, he is the epitome of modern tragicomedy and melodrama. It received Academy Awards for its re-release in 1942. The Gold Rush is an excellent film, both humorous and sad, and it is one of the greatest films of the silent era.